This is my first painting using watercolor pencils AND gouache. I just wanted to try something new… probably because tomorrow will mark my blog’s two-year anniversary. Wooohh. I can’t believe it!! 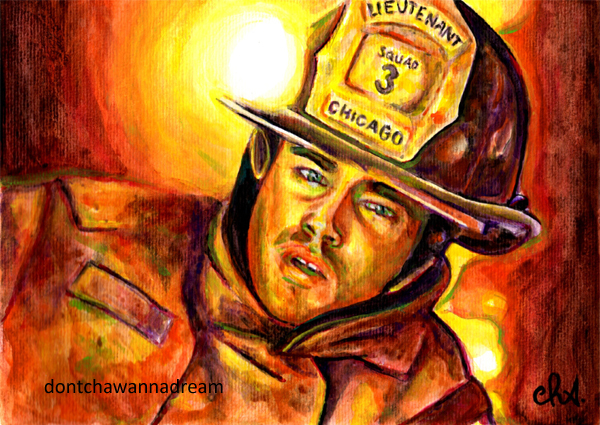 Hope you like this portrait of Taylor Kinney as Lieutenant Kelly Severide (from Chicago Fire). Just discovered the show… and as usual… I’m TOTALLY obsessed with it! Such a great show! Thanks a lot, Kellie!! 🙂 Love your work too, of course!! For a new technique, it sure looks good! You’ve captured the intensity and glow of the firelight very well. Happy 2nd blogiversary! You need some cotton gift. Maybe treat yourself to a new dress! I prefer food over clothes, I’m not a normal girl. Ohh the show’s really good! Love this one, Cha! Love the color choices! Any comments on the pencils? Did you find them easier than normal watercolors? So the watercolor pencils aren’t great if you want transparency. I mean the same transparency as real watercolor. But it’s probably because my pencils are cheap and also because I press a little bit too hard and when I add water there’s too much color (…because of adding different colors on a same spot for instance). Anyway they’re always good for a more opaque effect. But I have to say, if you’re watching a movie and are a bit lazy but still want to prepare a painting, it’s perfect! You can add some water after and you’ll have a great result. 🙂 That happens to me A LOT. I’m super lazy. Hope my review helps you. I completely agree with you! Try to clean the brush when you perceive that there is too much color. I do it practically in each new zone otherwise the brush keeps all the pigment. And I have not been able to remove the pigment as in real watercolor, you know, when you apply a tissue over the wet color. It seems the pigment dyes the paper quickly. but love it after a while. Beautiful, striking piece of art! Congratulations on 2-year anniversary, best wishes for many more to come. BTW I’m still working on my alphabet words, haven’t forgotten. Thanks a lot, Mary!! 🙂 Your comment made my day. Take your time, no pressure! Don’t know what gauche is…BUT the face it’s done also with watercolour pencils….amazing!!! I’m not sure we have it here but I’m watching it online anyway because I prefer original versions… in English. And Taylor Kinney is PERFECT!!! The brightness of the fire behind him is intense! Never heard of the series … but great work and selection of colors! Honestly I didn’t want to watch a firefighter-themed show… I thought ‘another dark and depressing show, no thanks!’. But the pilot was so great! I don’t know if it’s quite ‘fair’ to have that much success with your first attempt at a new combination/process! Awesome portrait! Ahah thank you!! I have to say, I really like this one too… which doesn’t happen to me a lot. lol I’m just disappointed because it didn’t have many views on facebook… but c’est la vie! This is great of Kinney, Cha. I can’t seem to manage much of anything with gouache except when I use the white once in awhile. Have you done James Spader, yet, from “The Blacklist”? I’ve been surfing around your blog trying to find him….. Currently my favorite TV actor. Thanks, Leslie!! Well, I use it pretty much like watercolor WITH watercolor. It depends. I haven’t done James Spader yet because to be honest, I don’t know who he is. lol Ahhhh will google his name!!! Oh, I can help you there. He is the lead actor in “The Blacklist” on NBC on Monday nights. He used to be on “Boston Legal”. I think his acting is incredible. Ohhh okay, I just googled his name but don’t know him!! 🙂 thanks for sharing, Leslie. I wish I could watch American tv just like you! French tv shows aren’t very good (just my opinion…). Except a new show with Donald Sutherland, you will find it in English. It’s called Crossing Lines. It’s French and German. Dumb me. I didn’t know you were in France, Cha. I watched Crossing Lines last season and liked it very much.